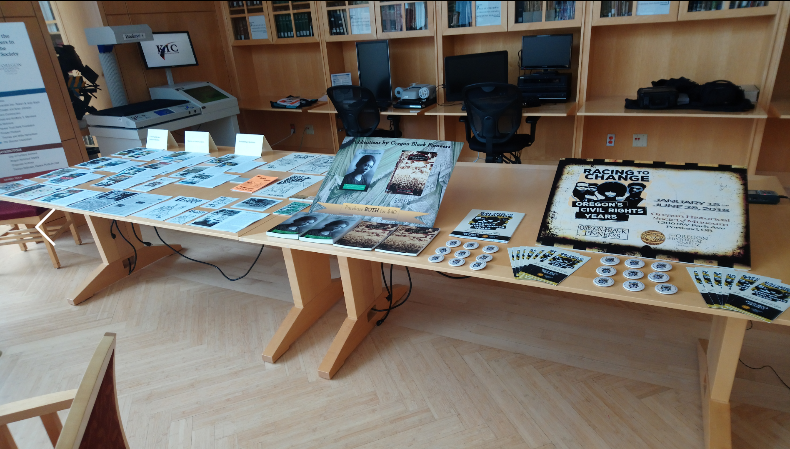 This summer the OMA and OSQA presented at the annual conference of the Society of American Archivists (SAA) held in Washington DC! Panel Description: Panelists present information on a wide range of projects, from the Densho Project, a large community-based oral history project about Japanese American experience, to Oregon State University’s collaborative efforts to document Latinx and LGBTQ+ communities, to the Inland Northwest Black History Collection. The discussion that follows covers methods used for collection development and access, factors promoting collaboration, and ethical challenges involved in approaching and curating projects documenting underrepresented communities. 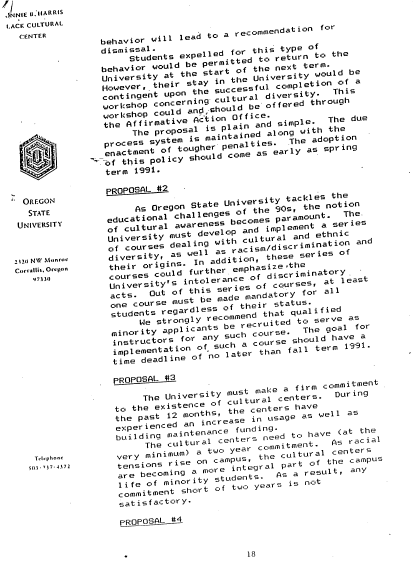 The Oregon State University Oregon Multicultural Archives and OSU Queer Archives is currently engaged in two oral history projects that enable – in one case, university students and in another, community members – the opportunity to engage with their local communities through oral history projects with groups that are traditionally underrepresented within the archival record, specifically, members of the LGBTQ+ community as well as members within Oregon’s Latinx communities. The presentation describes the two projects – OSQA’s local LGBTQ+ community oral histories and the OMA’s Latinos en Oregón oral history project – and addresses the methods for collection development and promoting collaboration (including collaborating with community liaison(s), training interviewers to conduct oral history interviews, as well as celebrating the interviewees and the stories shared), providing access to the stories gathered, and the ethical challenges involved in approaching and curating projects documenting underrepresented communities. On Sunday August 12, 2018 the 17th Oregon MLS cohort of Emporia State University’s School of Library & Information Management (SLIM) celebrated its graduation! The graduation ceremony took place in the auditorium of Oregon Health & Sciences University in Portland. Over two dozen students graduated this year, and Perri Parise, the Director of the Oregon MLS Program, could not have been prouder. The commencement speaker was Natalia Fernandez, the Curator and Archivist of the Oregon Multicultural Archives and OSU Queer Archives at Oregon State University. Her reflections on the ceremony are on the SCARC Speaking of History blog. The student representative speaker was Lynne Stahl. 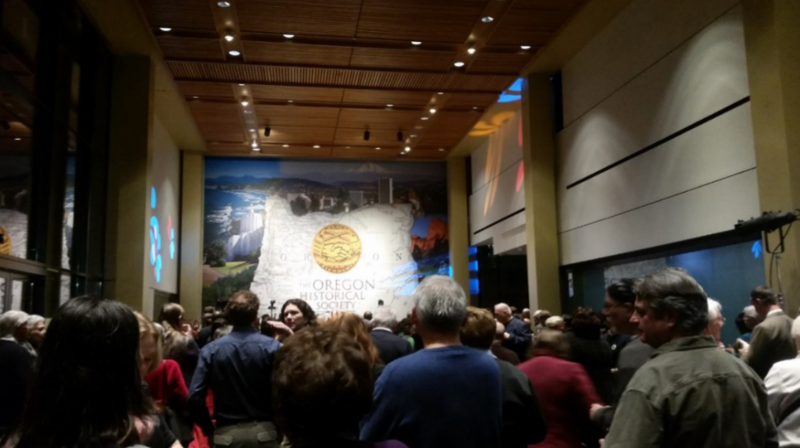 Additionally, Oregon’s Interim State Librarian, Caren Agata, and OLA President, Buzzy Nielson, were also featured speakers, and SLIM’s dean, Dr. Wooseob Jeong, was the ceremony’s MC. Fernandez spoke about how the graduates exemplify the Emporia State professional values of service, leadership, integrity, and mentorship. She expressed that as we advocate for equity and value diversity, we always have to remember it is not about our intentions, it is about the impact that we have; she encouraged graduates to always reach with one hand forward, while holding one hand back to lift others up; and she encouraged the students to remember that in their commitment to being leaders in our profession and our communities, our job is to use our positions of power to be advocates for those who lack power. She asked the graduates to consider the question: what the values of service, mentorship, and leadership have in common? Action. Fernandez then shared her journey of activism and social justice throughout her career thus far, and reflected on words of wisdom expressed in a 2010 lecture by the archivist Randall Jimerson entitled “Archivists and the Call of Justice.” She stated that in the journey toward social justice, as information professionals, we each have a role to play as part of the work that we do. One of the many beautiful aspects of our profession is that activism can take many forms. She closed by stating that it is incumbent upon all of us as information professionals to reflect upon our role and ask ourselves how we can be more pro-active to the cause of social justice as we serve, lead, and mentor others. When we fully commit ourselves to our professional values is when we can truly say that we are employing our power as information professionals, our expertise, and the love we have for our communities as we strive to promote a better society for all. 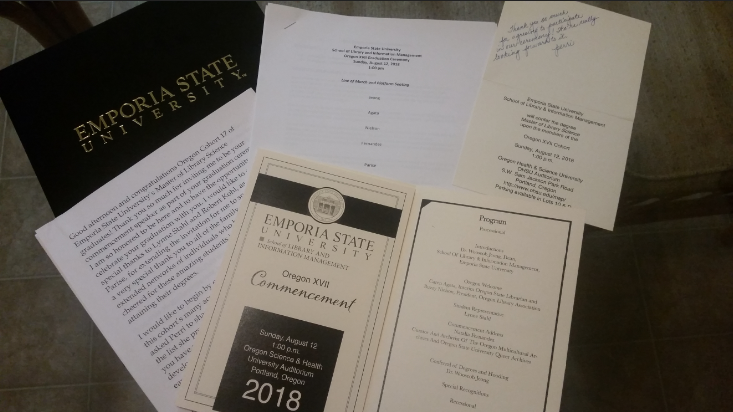 Excitingly, the 17th Oregon MLS cohort of Emporia State University’s School of Library & Information Management (SLIM) graduates are ready to take action – to serve, lead, and mentor – they are fellow activists! Pride Month is a time to celebrate who we are and the people we love, but it is also a time to reflect on where we have been and where we want to go. Remembering our histories is one of the most important parts of building the future we imagine for ourselves and our loved ones. 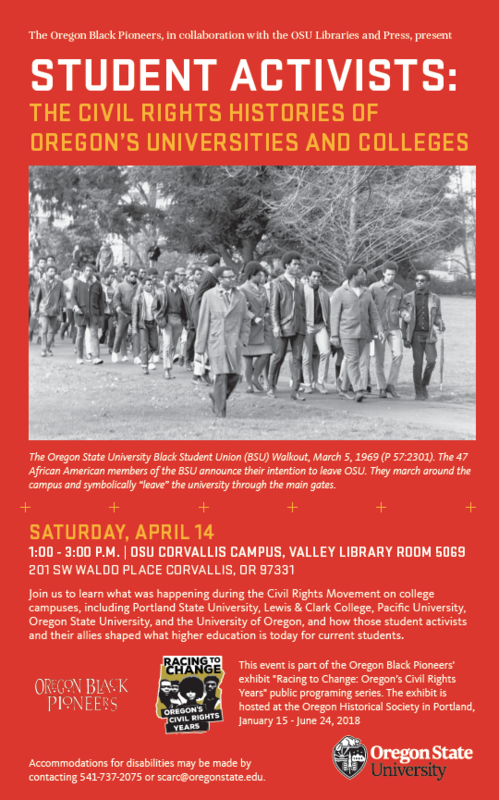 Here at the Oregon State University Queer Archives (OSQA), we have been working to document the histories of queerness at OSU, in Corvallis, and throughout all of Oregon in relation to the university. In the last few academic years, OSQA has grown into a wonderful resource for anyone looking to build their knowledge about queer history, and we invite you to come visit us. Our most recent project involved scouring The Daily Barometer for anything related to queer history throughout the 1990s. 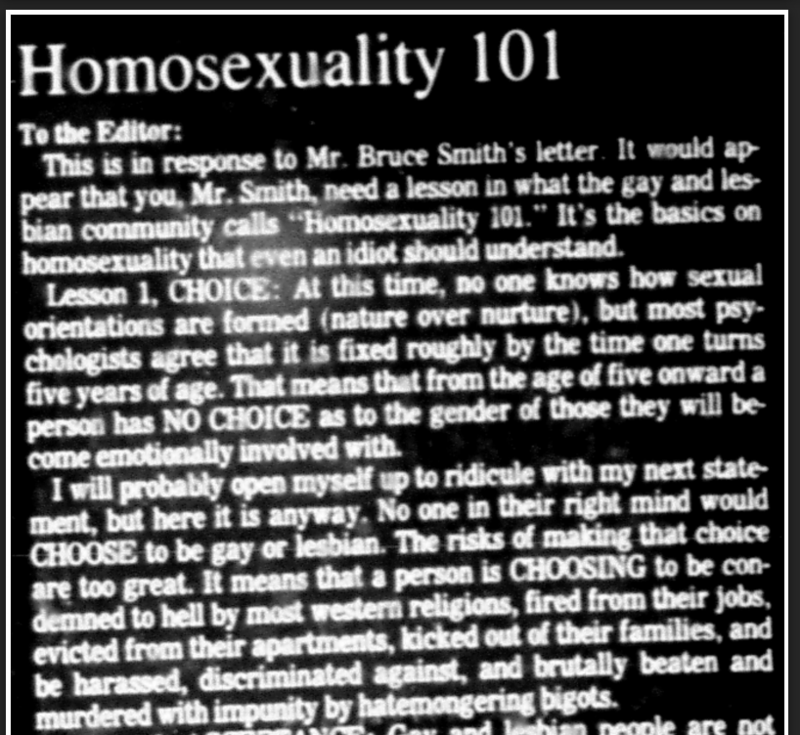 The 1990s were a difficult time for queer folks in Oregon. The Oregon Citizens Alliance (OCA) fought to pass several homophobic, queerphobic, and transphobic ballot measures. 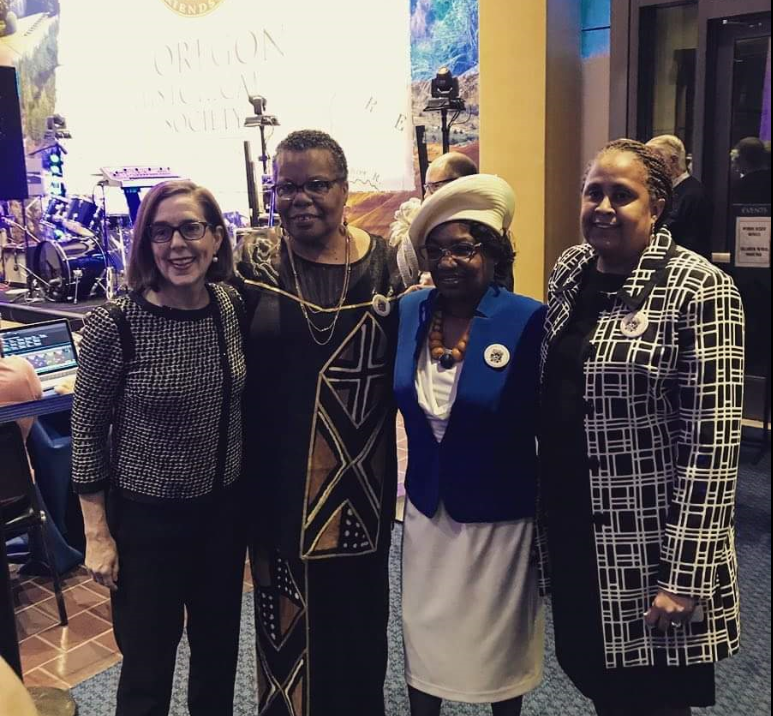 They won some battles, especially in the rural parts of Oregon, but thanks to the efforts of dedicated community members, such as the people involved in the organization After 8, the OCA was unable to accomplish many of their hateful goals. However, even as Oregonians successfully repelled the OCA, homophobia and queerphobia raged on in our communities and on our campus. The letters section of The Daily Barometer became a well-worn battleground where proponents of equality faced off against their adversaries. For example, one letter writer went so far as to suggest that OSU needed to abandon Benny the Beaver because he was attracting attention from the Lesbian Avengers, an activist group working against hatred and discrimination. But there were others who were incredibly brave and wrote to the editor in defense and support of the LGBTQ+ community. The Daily Barometer reported on these and a variety of topics, and in the spring of 2018, OSQA’s student worker reviewed the 1990s Barometer articles and selected the ones most relevant for the creation of the LGBTQ+ History in OSU’s The Barometer collection. Below are PDFs of the articles, organized by year, with a table of contents for each set of articles. If you desire to see a physical copy, the newspaper is available in printed and bound copies, as well as on microfilm. The OMA was honored to participate as part of the 25th Anniversary Celebration of the Difference, Power, and Discrimination (DPD) Program. At the anniversary event, the DPD was celebrated, awardees were honored, and acclaimed researcher/author Tricia Rose gave a riveting speech. 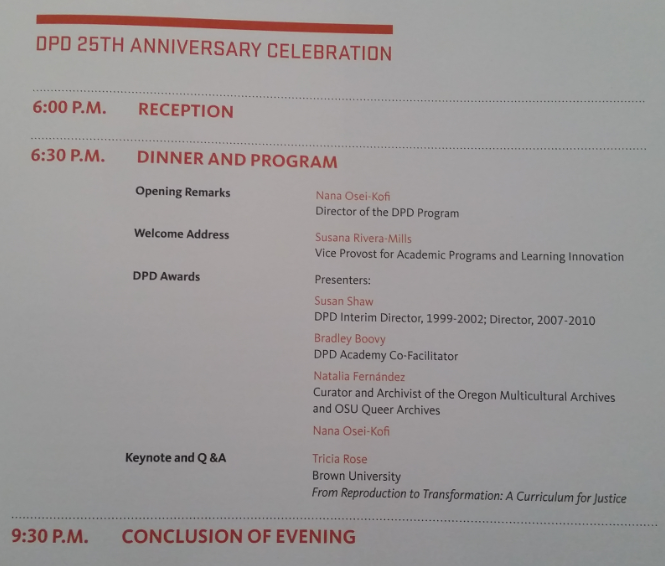 The awards included two teaching for change awards for Professors Quo-Li Driskill and Professor Steven Shay, as well as a legacy award for Annie Popking, the first DPD director, 1992-1994. In addition, all of the directors present at the celebration were honored. 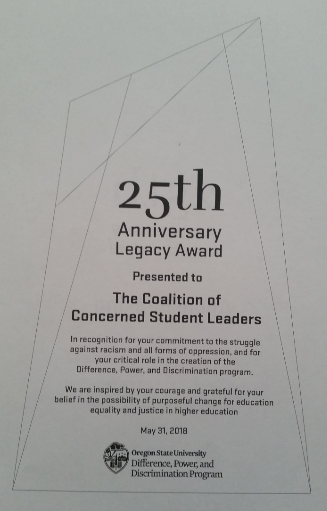 “The second 25th Anniversary Legacy Award goes to the Coalition of Concerned Student Leaders. I am so honored that Nana invited me here this evening to talk about the Coalition of Concerned Student Leaders, as well as the historical significance and impact of student activism here at Oregon State University. 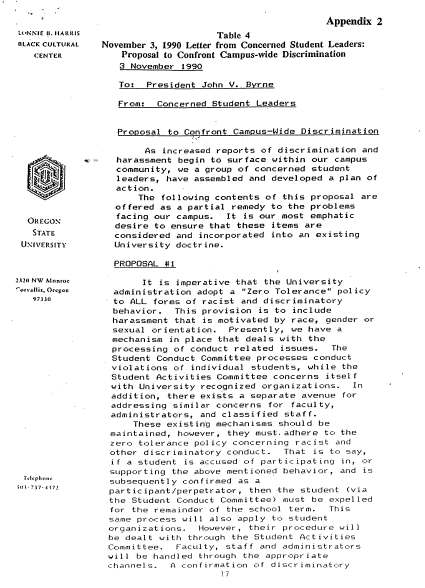 The opening line to the 1990 Letter from Concerned Student Leaders: (A) Proposal to Confront Campus-Wide Discrimination was “As increased reports of discrimination and harassment begin to surface within our campus community, we a group of concerned student leaders, have assembled and developed a plan of action.” The proposal, which the students addressed directly to the university president, specifically called out the need to educate students and faculty on the value of culture and diversity. 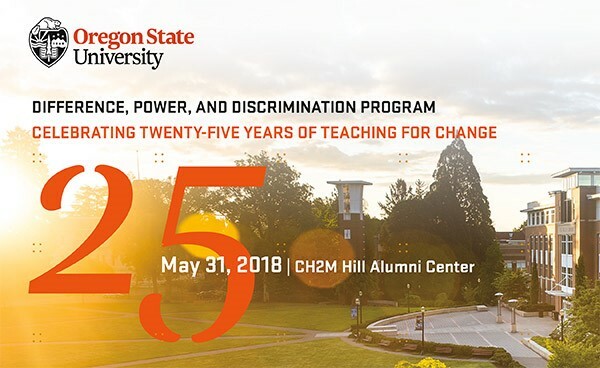 It is thanks to their voices that the Faculty Senate created the “Affirming Diversity Committee” so that today we celebrate the 25th year since the establishment of the Difference, Power, and Discrimination program. 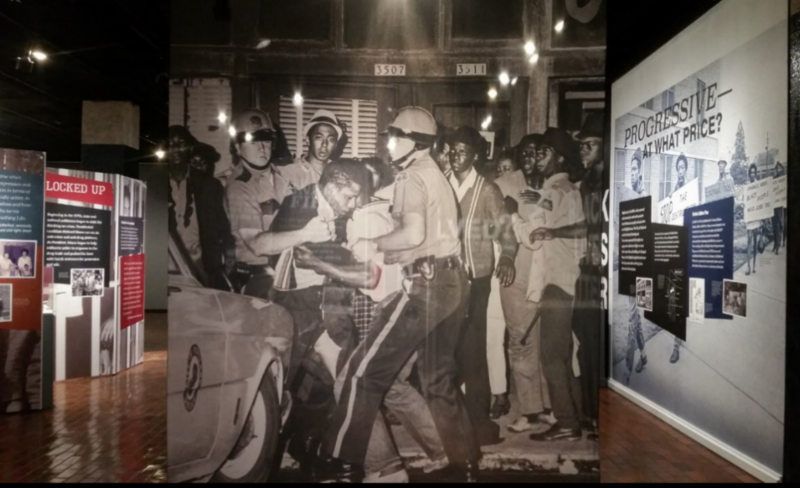 The efforts of the Concerned Student Leaders were not the first, nor would they be the last time that OSU students used their collective voice to demand change. 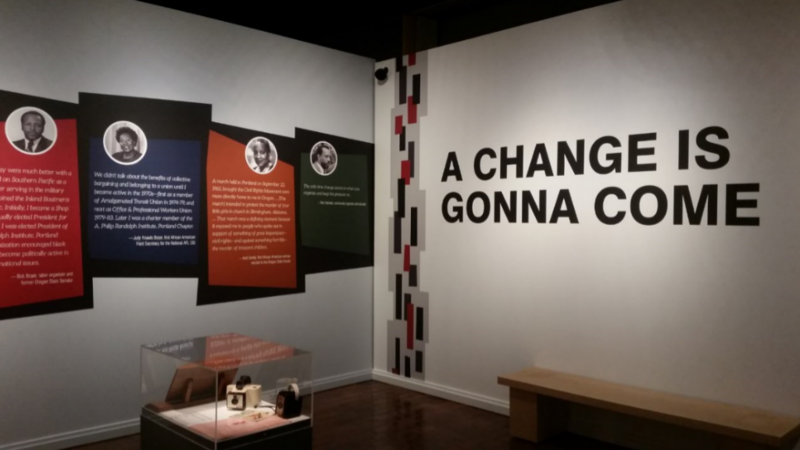 It is in large part due to the power of student activism that OSU continues making strides in its journey towards becoming a socially just institution and community. Students, especially students of color, working with the support of allies, have a long history of recognizing their power and wielding it to shed light on invisible injustices and to create change benefitting the entire OSU community. 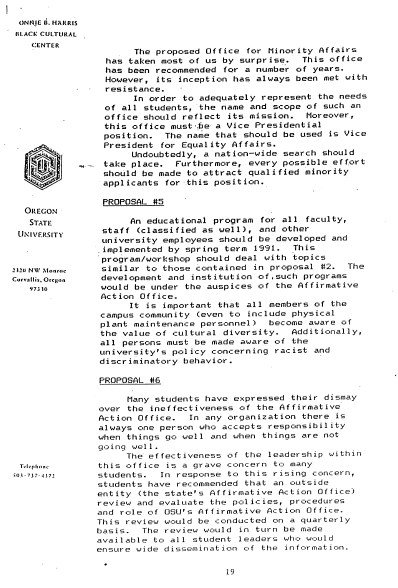 For example, in early 1969, the OSU Black Student Union called on the administration to increase the university’s efforts to support black student recruitment, retention, and success. Due to what the BSU deemed an insufficient administrative response, not only to their proposal but also to the way in which the rights of a black student athlete were violated, over the next few months, the BSU led boycotts, protests, and printed an underground newspaper to call attention to and gain support for their cause. 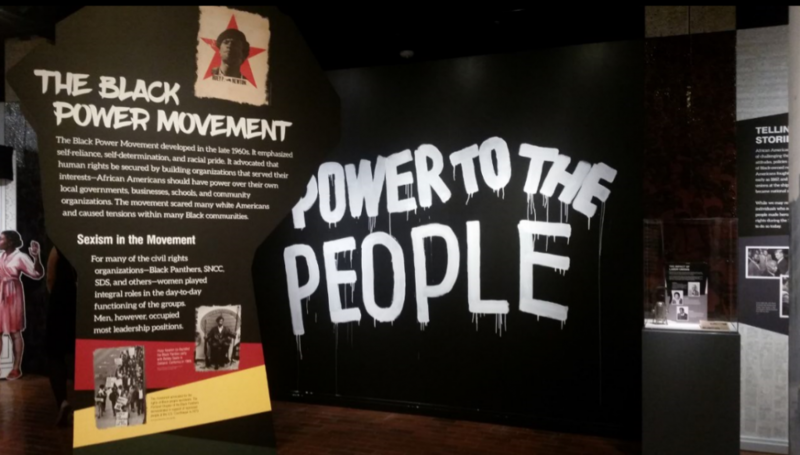 The power of the BSU’s efforts led directly to the establishment of the Educational Opportunities Program that same year, as well as sparked the activism that led to the establishment of a number of cultural centers during the 1970s. 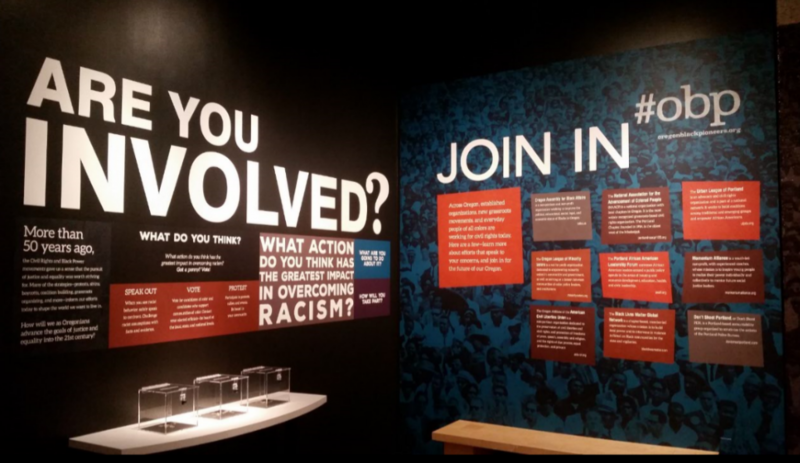 Since the 1970s, there have been a number of student led movements including, but by no means limited to, anti-apartheid protests in the early 1980s, a mass boycott and march in 1996 due to multiple racist acts, a mid-2000s initiative to give honorary degrees to the Japanese American students forced to leave their studies during World War II, a Solidarity March in 2014, as well as community dialogues inspired by the national Black Lives Matter movement. 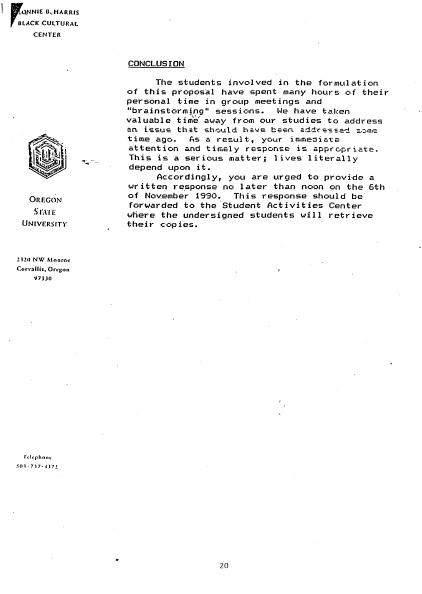 More recently, almost 25 years to the date of the 1990 Concerned Student Leaders proposal, students organized and led the “Students of Color Speak Out” in 2015. At the “Speak Out” members of OSU’s students of color communities again called on the university to prioritize their safety and well-being, as well as the need for OSU community members to engage in identity and social justice trainings. Yet again, we see the demand and necessity of community education as part of the march towards social justice. There are these and many more stories to share. 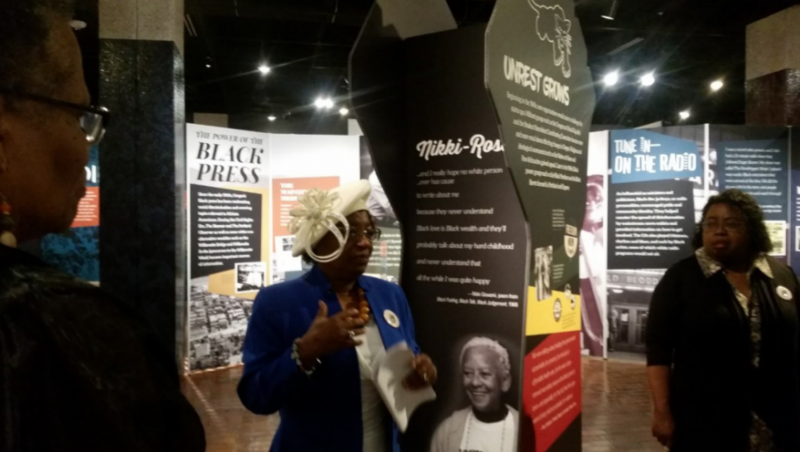 As an archivist, I have the privilege to preserve and make these stories accessible to the public so that others can learn from them and be inspired by them. 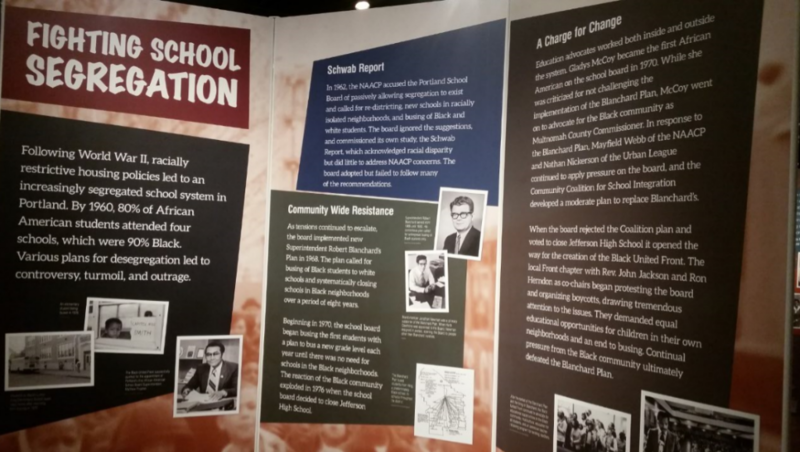 While on the one hand, it is discouraging to see that for almost 50 years students have had to protest the same issues, fight the same injustices, and call to action for the same causes, it also gives me hope. Each new generation of students challenges OSU, as an institution and as a community, to reflect and grow and be held accountable when it fails to live up to its professed mission and values. Each new generation of students find their voices, speak their truths, and make sacrifices now to cause ripple effects into the future positively impacting the next generation of students. 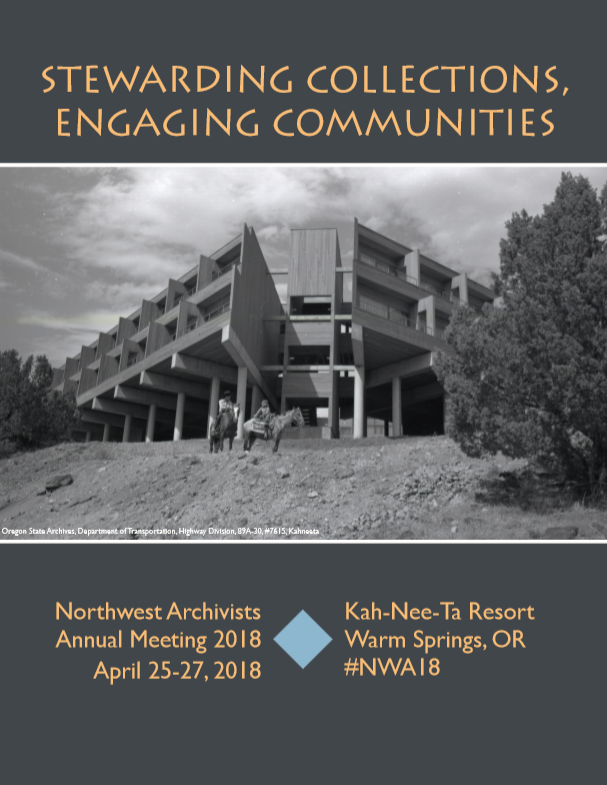 The OMA attended, and presented, at this year’s Northwest Archivists conference in Warm Springs, Oregon. 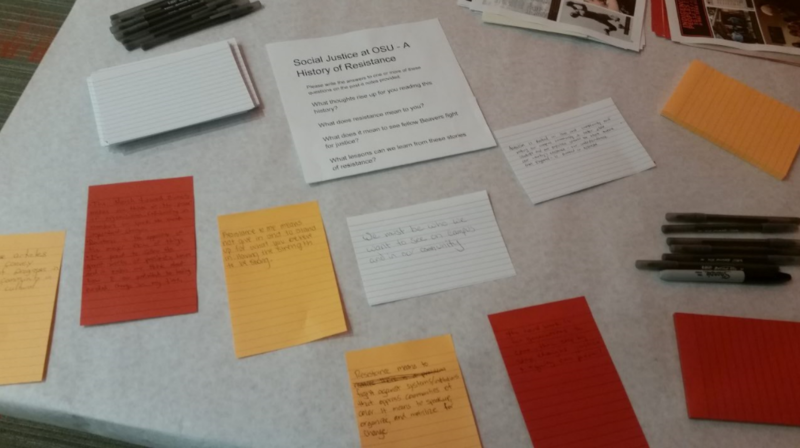 The presentation “Campus Connections to White Supremacy: The Role of Archivists in Reconciliation through Community Engagement and Historical Research” focused on the Fall 2017 OSU Building and Place Names Evaluation Process. 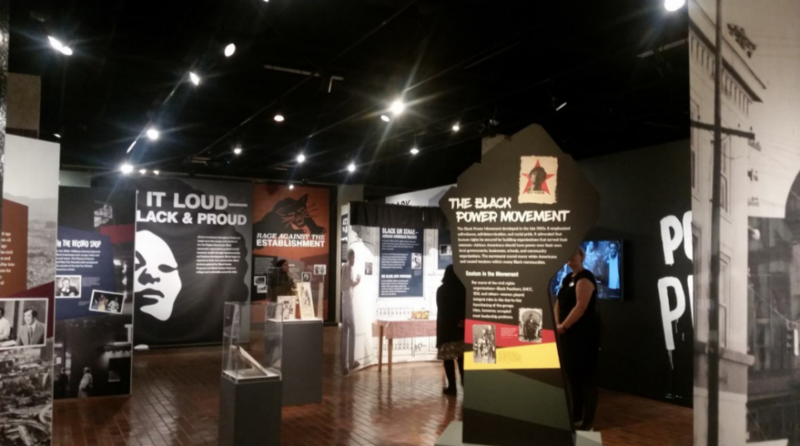 Presentation Abstract: In recent years, more and more communities, including colleges and universities, across the United States are challenging the existence of memorials and place names associated with the confederacy and white supremacy. 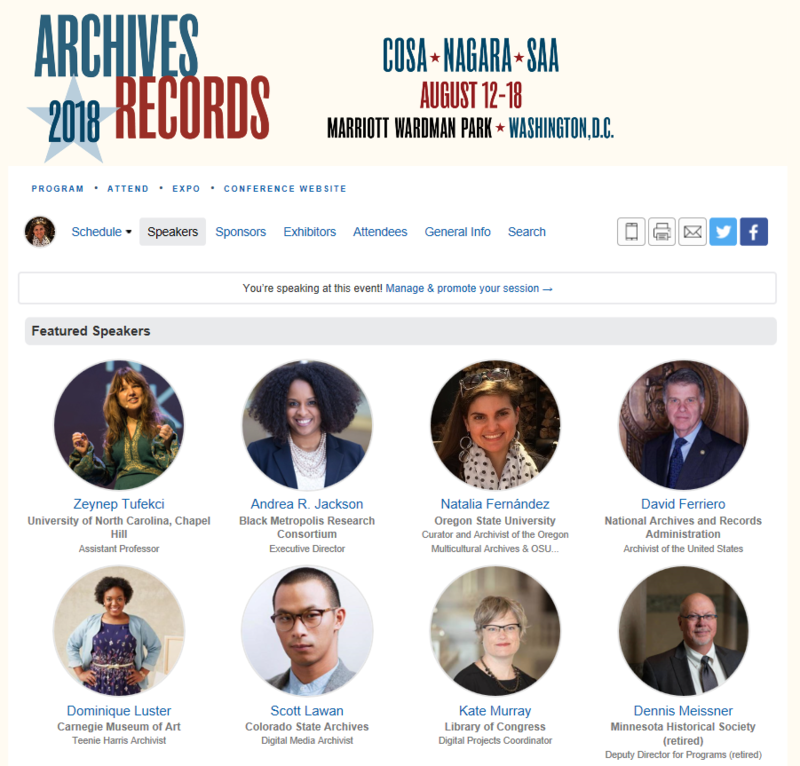 Archivists and special collections librarians are often called upon to provide historical context, and have the opportunity to engage their communities in productive and transformative discourses. 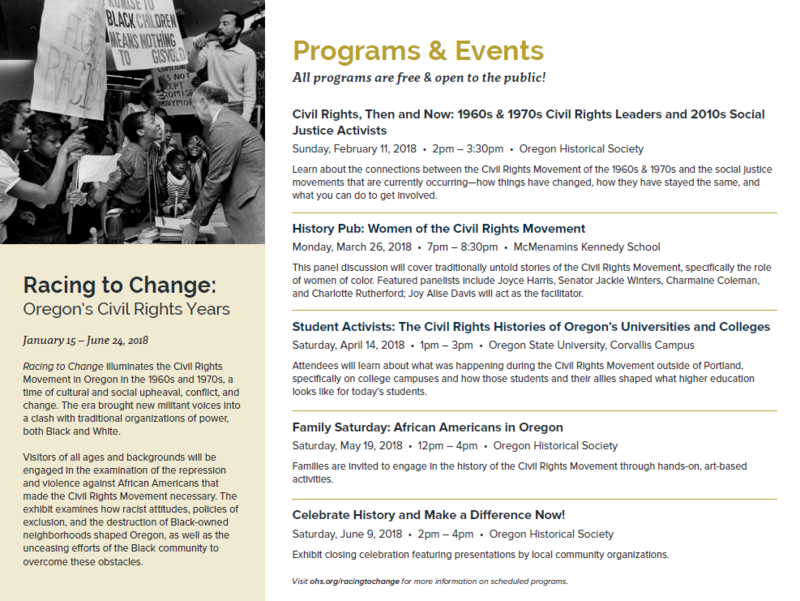 In addition to an overview of campuses across the United States engaging their communities in efforts to reconcile current values of inclusion and diversity with their racist histories, as a case study, attendees will learn about the Building and Places Names Evaluation process at Oregon State University. Attendees will be able to adapt the information learned, including elements of the process such as developing evaluation criteria, providing historical research assistance, designing and implementing a community engagement plan, and planning for permanent education accessible to community members, to achieve successful collaborations within their own communities. 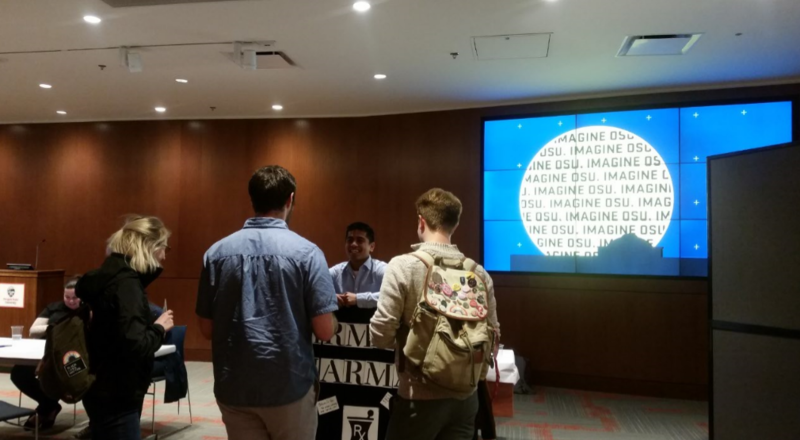 The OMA and OSQA were thrilled to participate in Imagine OSU, an opportunity for the OSU community to engage in an event organized around creative workshop stations aimed at facilitating connection, reflection and the co-creation of a shared vision for our university. 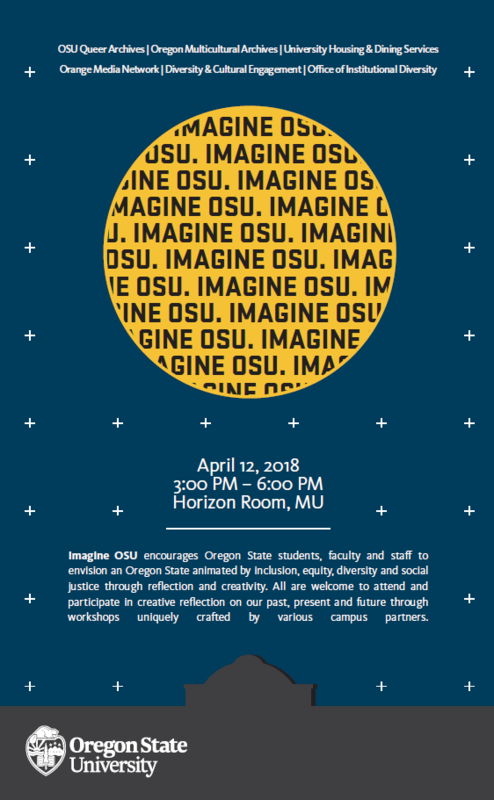 Imagine OSU encouraged Oregon State students, faculty and staff to envision an Oregon State animated by inclusion, equity, diversity and social justice through reflection and creativity. The event was designed to encourage participants to translate aspirations and values – as a university community and as individuals – into action. 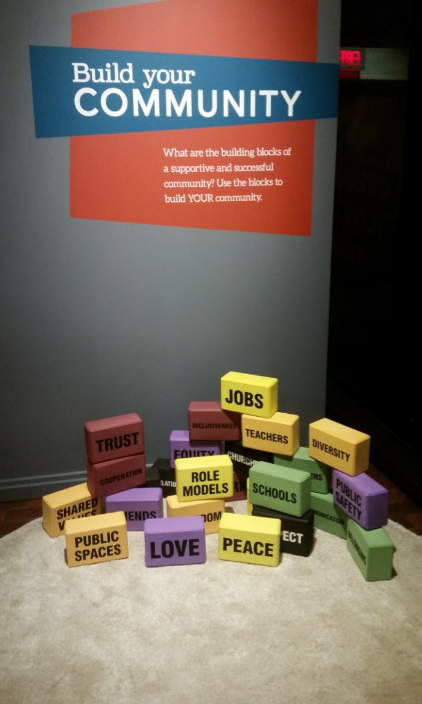 Participants were encouraged to use audio and video, social media, comment boards, and creative arts to reflect on our past, present, and future. The comments, interviews, reflections and insights gathered during the event will be used as the source material for ongoing “Imagine OSU” projects – a living archive of prose, poetry, artwork, documentaries, collages, installations and more. Imagine OSU consisted of five stations. 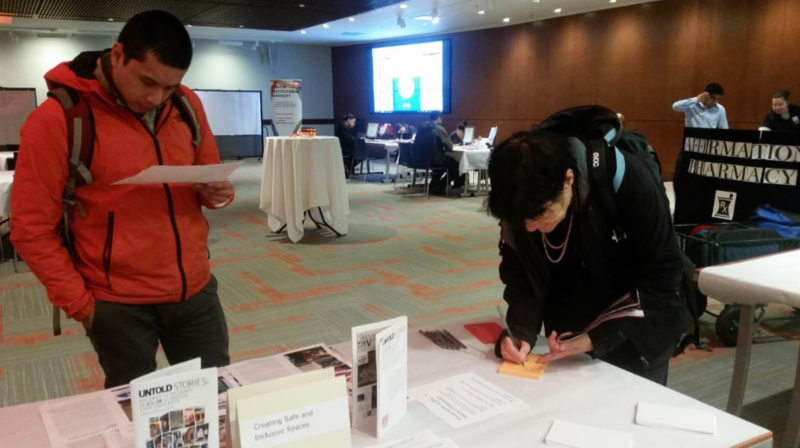 Workshop stations were hosted by partners including the OMA and OSQA, Orange Media Network, University Housing & Dining Services, and Diversity & Cultural Engagement. 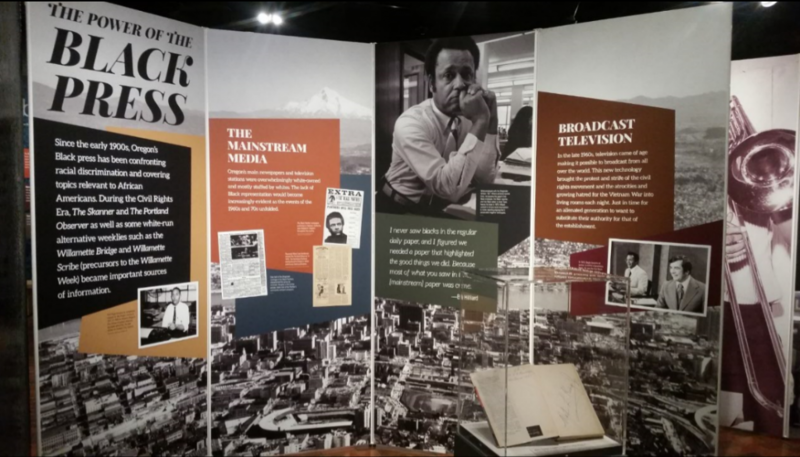 Our station included documentaries and materials from the Untold Stores Guidebook that allowed participants to reflect on Oregon State’s social justice history and how the community has responded in times of challenge. Participants were encouraged to write their reflections on sticky notes and affix them to the comment board. What thoughts rise up for you reading this history? What does resistance mean to you? What does it mean to see fellow Beavers fight for justice? 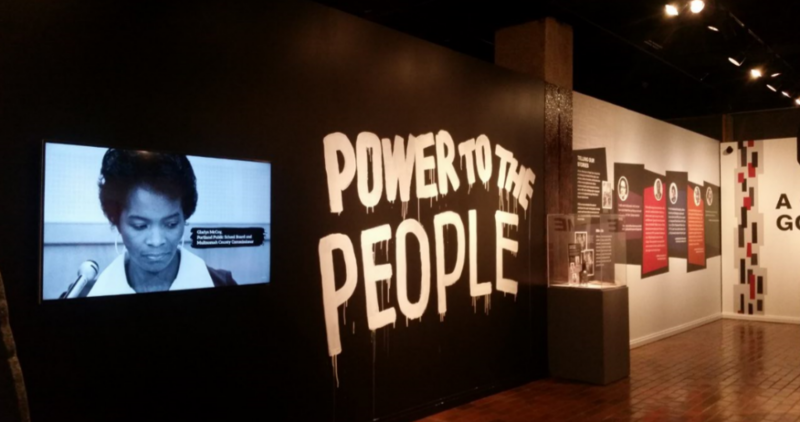 What lessons can we learn from these stories of resistance? 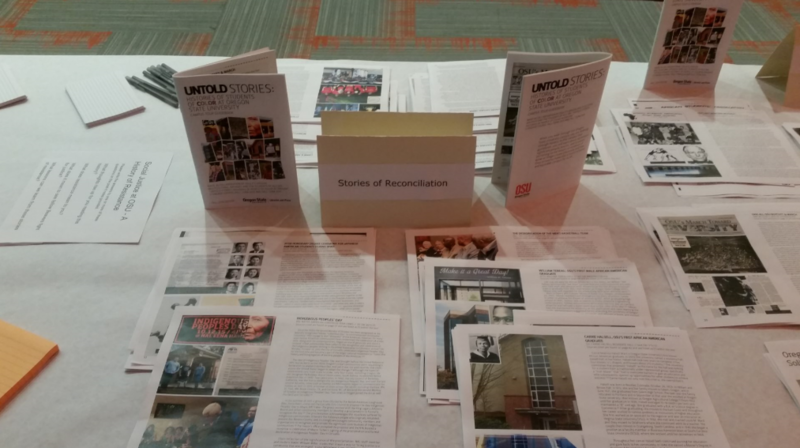 Station Two – Audio/Video Stories ~ Participants selected a prompt that encouraged reflection on a variety of topics related to social justice at Oregon State and beyond and respond in video or audio formats. An Orange Media Network staff member was available to assist. Station Three – Affirmations ~ Participants reflected on envisioning a university community of care where we are both the givers and receivers. Participants were encouraged to write affirmations that were be posted at the station as well as were encouraged to take an affirmation of their own. Station Four – Reflection → Creation ~ Using provided materials, participants selected a prompt, reflect, react and create. Station Five – Hop Online ~ Within the #ImagineOSU Twitter Moment on the Office of Institutional Diversity Twitter page, participants were encouraged to react to prompts to join in the conversation. Participants also picked their own prompt and contributed reflections and questions by using the hashtag #ImagineOSU on Facebook, Twitter and Instagram. 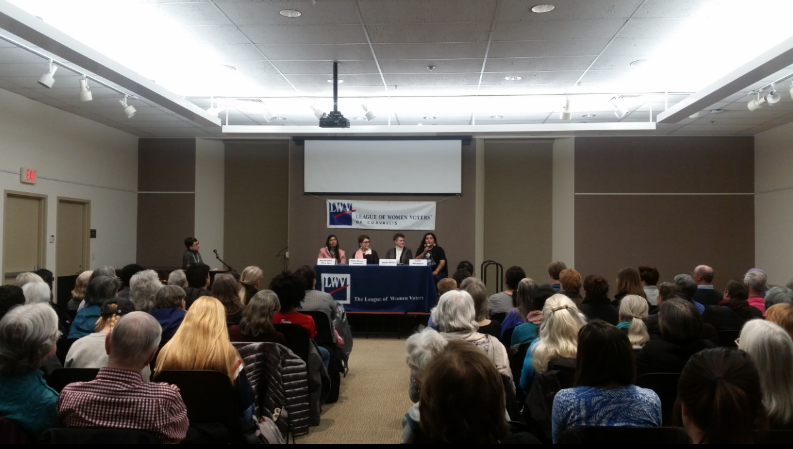 The “Feminist Forward: The Future of the Feminist Movement (League of Women Voters)” panel was a powerful evening of story sharing by four incredible women: Dr. Allison Davis-White Eyes, Dr. Susan Shaw, Maria Chavez-Haroldson, and Luhui Whitebear. Topics discussed included being a leader and leadership, being a feminist, ethics of care, feminism, strategies to interrupt and make change (personally, ideologies, structures, etc. ), as well as where the Feminist Movement is going in 2018, and beyond. The presidential election of 2017 marked a new chapter in the Feminist Movement. The 2017 Women’s March was the largest protest in U.S. history. The League of Women Voters (LWV) is an organization founded in 1920, by Carrie Chapman Catt, just six months before the 19th amendment was ratified. This activist and grass roots organization believes that voters should play an important role in our democracy. The “Feminist Forward: The Future of the Feminist Movement (League of Women Voters)” discussion occurred the day before the 98th Anniversary of the League of Women Voters. The panelists addressed these questions: What does “intersectional feminism” mean to you? What are the most pressing questions facing the feminist movement in 2018? What does leadership mean to you? How do you incorporate feminism into your leadership style? What message would you like the audience to leave with today? Panelists also answered additional questions from the audience. The event was co-sponsored by the League of Women Voters and the Corvallis-Benton County Public Library. Dr. Allison Davis-White Eyes, OSU Director of Community Diversity Relations in the Office of Institutional Diversity, previously the Assistant Vice Provost and Director, Diversity & Cultural Engagement. Her research interests include; intersectional theory, the queering of identity and space, and the mobility and migration of culture and identity. Dr. Susan Shaw, OSU Professor of Women, Gender, and Sexuality Studies and previously Director of the School of Language, Culture, and Society. Shaw’s work on Women’s Theology has been widely circulated in a majority of Huffington Post articles. Shaw is also a co-author of one of the most used Women Studies textbooks in the country, Women’s Voices, Feminist Visions: Classic and Contemporary Readings. Maria Chavez-Haroldson, Owner of Culturally Responsive Solutions, a consulting business focusing on equitable, diverse, and inclusive organizational development practices. Chavez-Haroldson has over 25 years of professional experience as an administrator and leader of social justice change in state governments and non-profits. Luhui Whitebear, Member of the Coastal Band of the Chumash Nation, OSU Ph.D. student, a mother, poet, and Indigenous activist. Her research focuses on a variety of Indigenous issues ranging from the violence against Indigenous women, reclaiming of Indigenous identity, as well as Indigenous movements of resistance and natural resource protection, such as her work with the Dakota Access Pipeline Resistance Movement. Panelists: Dr. Allison Davis-White Eyes, Dr. Susan Shaw, Maria Chavez-Haroldson, and Luhui Whitebear. Format: The panelists for this event were seated in front of their audience in a single line behind a table. The event started with a short introduction of the panelists and then progressed into a Q&A. After this brief Q&A the dialogue was opened up to community members to ask the panelists questions. Topics included being a leader and leadership, being a feminist, ethics of care, feminism, strategies to interrupt and make change (personally, ideologies, structures, etc. ), as well as where the Feminist Movement is going in 2018, and beyond. 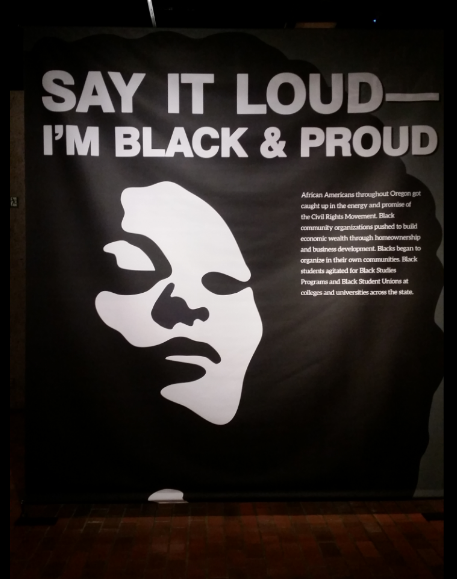 “The Black Woman Series” discusses how race intersects within our everyday lives. 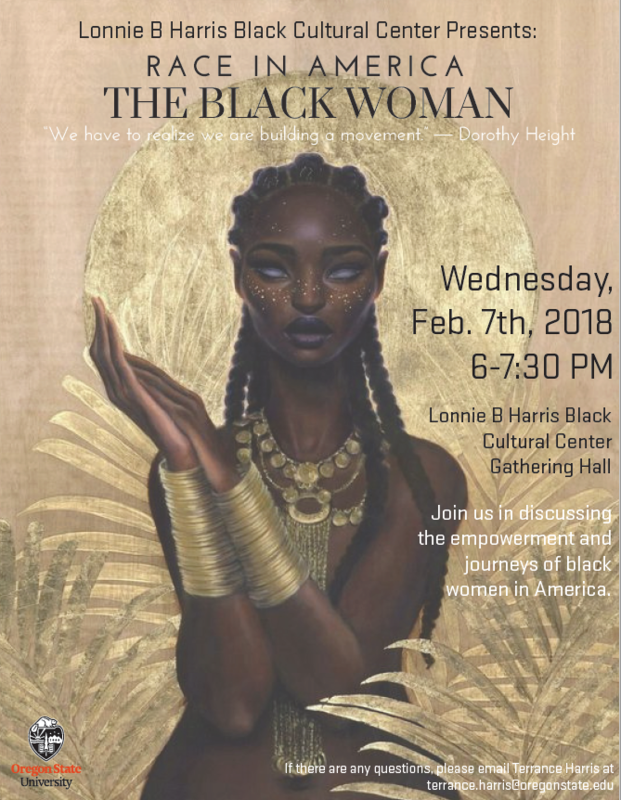 The first part of this series went over what it is to be a black woman as well as what that experience is like. 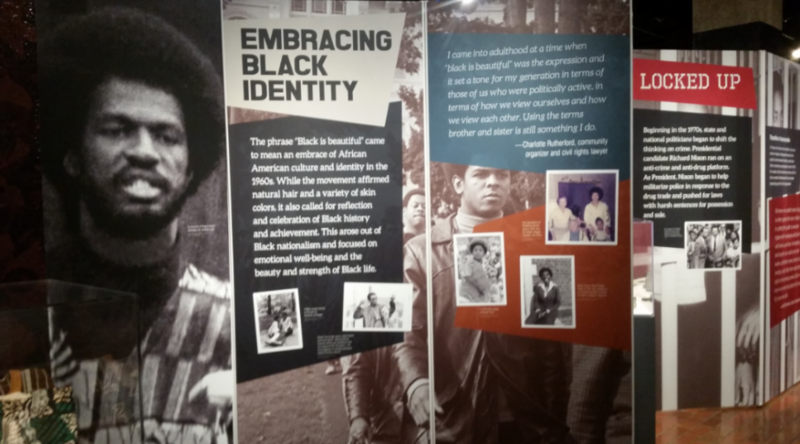 The second part of this series focused on the concept of Colorism. The seven panelists featured in this discussion shared their personal experiences with colorism throughout their lives. 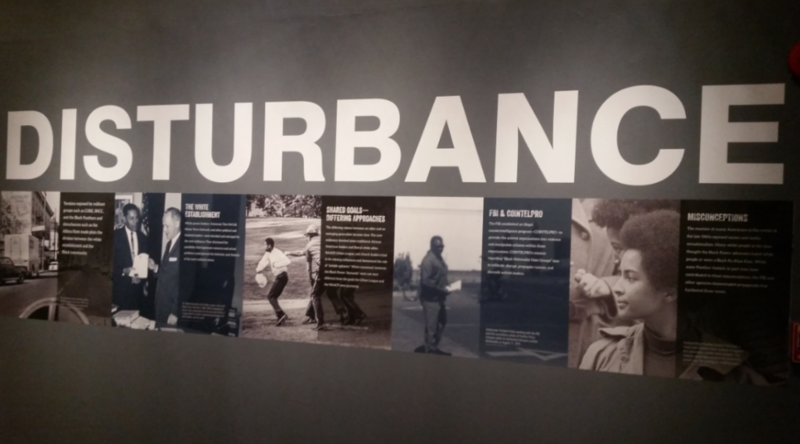 The event also featured a brief video, “Why Women Change the Color of Their Skin.” This video discusses issues of colorism through looking at the controversy over Lil Kim the rappers’ undergoing facial reconstructive surgery and skin lightening to look whiter. Due to current beauty ideals, there is pressure for women of color to conform and change the way they look in order to meet these standards. These beauty standards include having light skin, blond hair, blue eyes, and being slender. Patience Zalanga, a photographer, stated that Lil Kim’s transformation is an extreme but it is not a phenomenon as, “black women and women of color are always aspiring to get as close to white as possible, and fit those beauty standards.” There is a multi-million dollar skin bleaching industry within the United States. According to the W.H.O. (World Health Organization) in 2011, 77% of women in Nigeria used skin-lightening products regularly, as did 40 % of women in China, Malaysia, the Philippines, and South Korea. These statistics show the prevalence of colorism not just in the United States, but globally as well. Further suggested educational learning on this topic: The 1941 novel by Tony Morrison, The Bluest Eye. Colorism: Prejudice or discrimination against individuals with darker skin tone/complexion, typically among people within the same ethnic group. Colorism is not just an issue in the United States or isolated to African American communities, it occurs globally as well. Colorism has a lot to do with a proximity to whiteness, how close someone is or appears to be to whiteness. This in turn instills a light skin privilege. Historically, this divide within the African American community manifested itself in times of slavery through allowing lighter skinned slaves to work inside the home, while darker skinned slaves had to work outside. Another concept relating to Colorism is the idea of Passing. When an individual “racially passes,” they are able to appear white, allowing them access to privilege compared to their counterparts. Until the 20th century, the “brown paper bag rule” persisted in African American communities. The “brown paper bag rule,” determined who would have access to privilege and inclusion in various organizations, universities, and events. In turn, this rule denied entry to individuals whose skin stone was darker than a brown paper bag. Marilyn Stewart, an Alumni of Oregon State University, works as an Academic Advisor for the College of Liberal Arts at Oregon State University. The core of her approach as an academic advisor is assisting students to make informed decisions in becoming even more academically successful as they move toward their goal of earning a College of Liberal Arts degree. Marilyn came to Oregon from Washington D.C. however she originally is from Northern Florida. Dr. Tenisha Tevis, is an Assistant professor in College of Education with an emphasis in Adult and Higher education at Oregon State University. Tenisha’s research focuses on the policies and practices higher education administrators utilize to help disenfranchised students gain access to and persist through college. Specifically, she explores disability services and the polarizing effects of race. Tenisha grew up in Sacramento, California but came to Oregon from Stockton, California. Dr. Ramycia McGhee, is a Chicago native and holds a B.A. in Broadcast Journalism from UW-Whitewater, M.S.in Journalism from Roosevelt University, and an Ed.D in Education Leadership Management from Capella University. Before beginning her career at Linn Benton in fall 2017, she worked as an adjunct English instructor for City Colleges of Chicago. Her specialties include developmental writing and adjunct professional development. Elizabeth Kaweesa, is a third year PhD student in the Chemistry department at Oregon State University. Her research focuses on drug discovery as well as cancer research. Elizabeth also serves as the president of the Black Graduate Student Association. Elizabeth is from a fishing village near Lake Victoria in Uganda. Kayla Spears, is the Student Leadership Liaison at the Lonnie B. Harris Black Cultural Center. Kayla is a fourth year Political Science major and the vice president of the NAACP chapter at Oregon State University. Justeen Quartey is a fourth year Public Health major and the president of the Black Student Union at Oregon State University. Justine was born and raised in Sacramento, California. Sarah Smith, an Alumni of Oregon State University, is a University Development Project Coordinator 1 for the Carlson College of Veterinarian Medicine at Oregon State University. Sarah is from Beaverton, Oregon. Panelists: Marilyn Stewart, Tenisha Tevis, Ramycia McGhee, Elizabeth Kaweesa, Kayla Spears, Justine, and Sarah Smith. Format: The panelists for this event were seated in front of their audience in a single line. The event started with a short video and then progressed into a Q&A and open community dialogue format with the panelists. 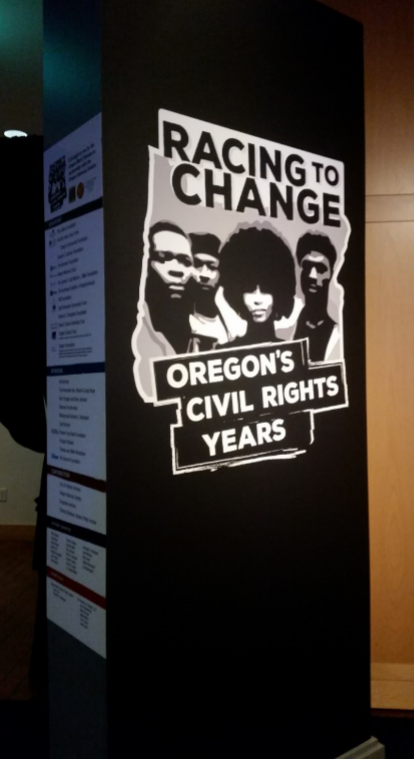 This evening, the OMA was delighted to attend the reception for the Oregon Black Pioneers’ new exhibit “Racing to Change: Oregon’s Civil Rights Years” at the Oregon Historical Society. Check out the pics below! 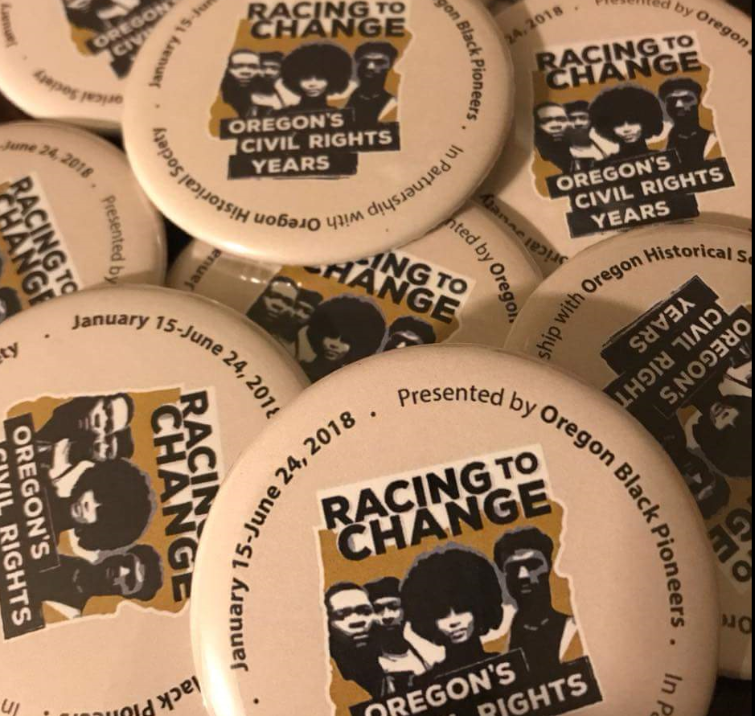 Racing to Change: Oregon’s Civil Rights Years is a groundbreaking exhibit with associated public programs about the courage, struggle, and progress of Oregon’s black residents during the civil rights movement in Oregon in the 1960’s and 1970’s. 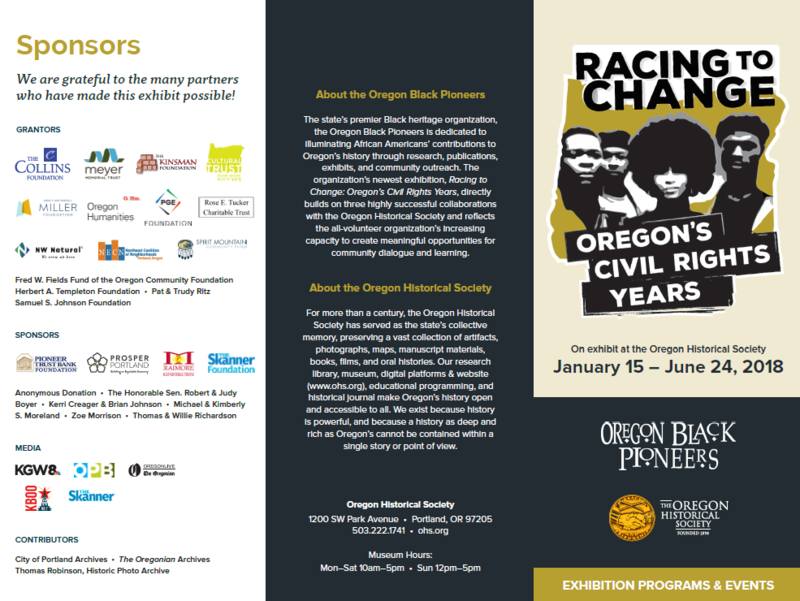 The exhibit will be hosted by the Oregon Historical Society January 15-June 24, 2018. 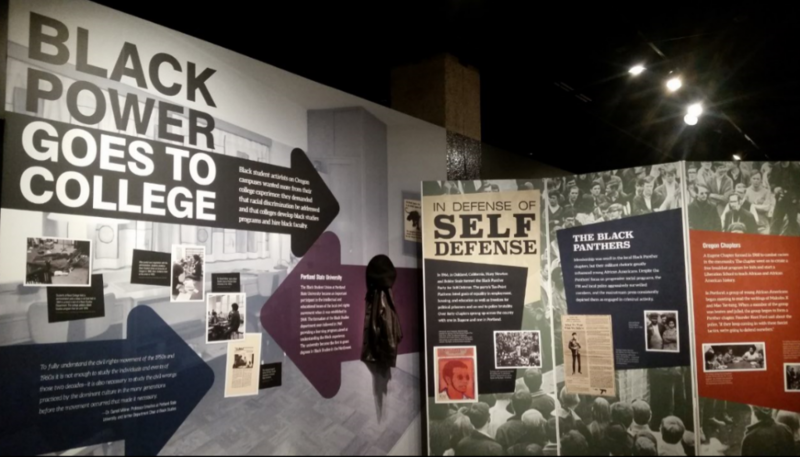 The interactive exhibit will engage visitors of all ages and backgrounds as it traces how housing and employment discrimination practices affected Oregon’s black populations and spurred the civil rights movement in Oregon. 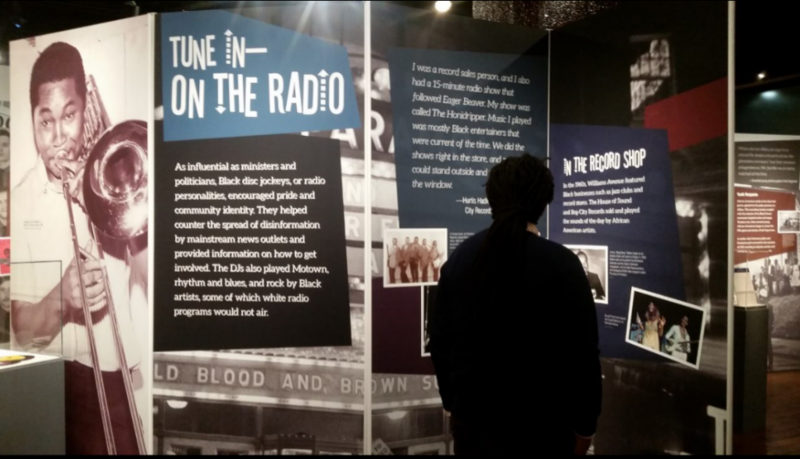 Through personal photos and artifacts, text, and interactive experiences, the exhibit will illuminate Oregon’s vibrant black community during the civil rights era, amongst a larger cultural and legal context of discrimination and displacement.